Lantek Integra Sales is specially designed to accommodate all the needs associated with the sales cycle of a company. All the necessary information is available immediately to all employees involved in the sales process. This creates an opportunity for the employees’ time to be spent in higher value-added tasks. 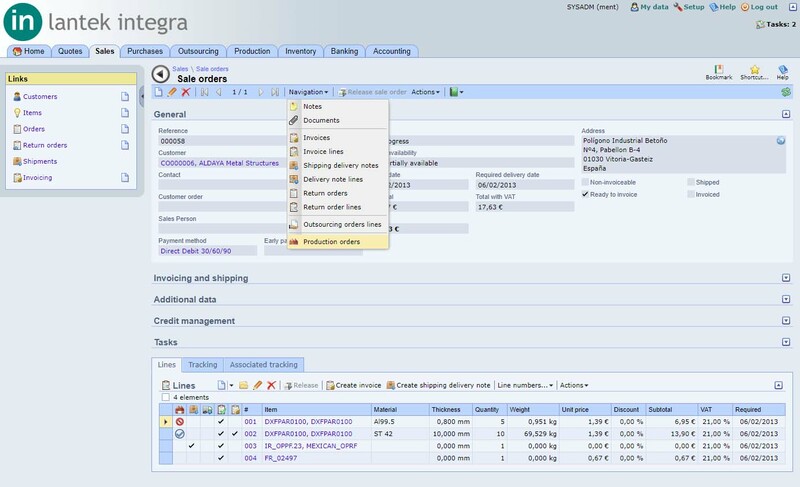 Lantek Integra Sales provides the integral management of all sales orders. If an offer is made, the system gathers all the quote information and allows the modification of each item. People involved in sales management are regularly informed of their progress. 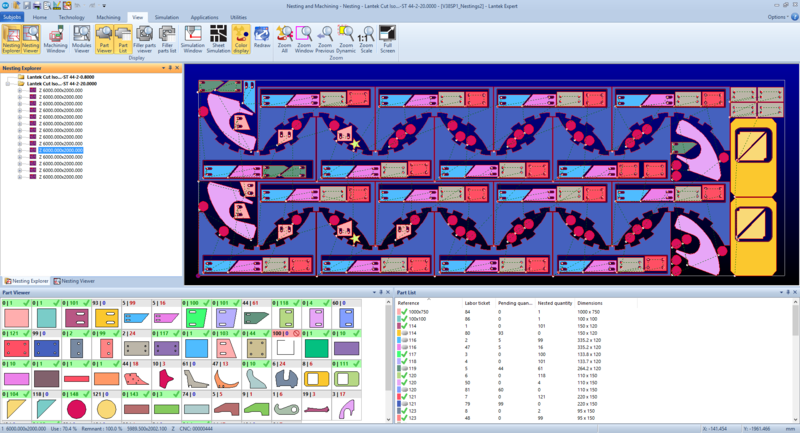 This solution includes different views for order lines: one focused on costs and price management and another one specifically designed to follow an order. This system also manages the consignment of manufactured products. It always keeps control of orders and their status, in real time. From the sales module, and thanks to a configurable view to speed up the process, it is possible to access the generated consignments and pending invoices. Lantek Integra Sales manages all registered sales invoices. Invoicing may be made against a sales order, against a delivery note, or on demand. By means of configured views to optimize the invoicing process, it is possible to have access to invoices and pending shipments. The sales order status and/or delivery notes are updated after each fulfilled invoice. Using filters, it is easy to access different invoices classified according to user’s criteria: invoices to account, invoices accounted, and invoices paid, among other things. The detailed registration of each sales invoice is fully integrated with the accounting modules and the estimated payments. 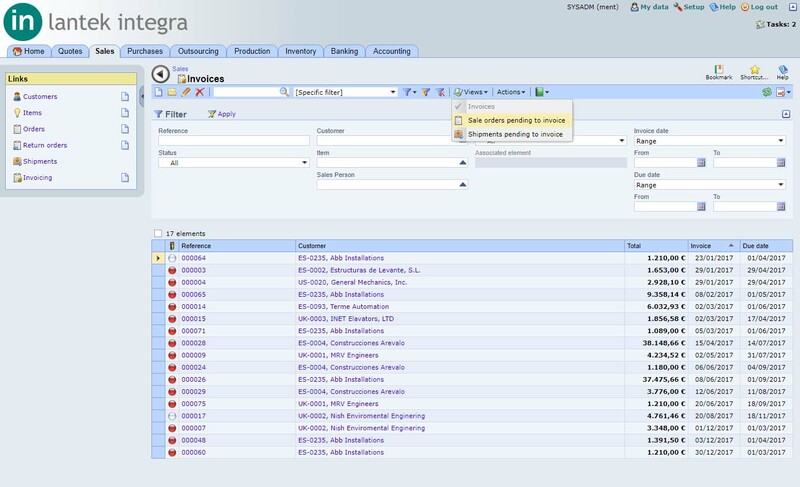 Lantek Integra Sales includes risk management functionality for the enterprise. It provides an efficient tool to ensure the complete management of the invoicing function. Each company has its own risk management limit. Every time a sales element is registered, whether it is an order, delivery note, or invoice, the system checks the element against the current total risk and advises accordingly. Should the risk limit be exceeded, there are options to lock the customer, redefine the limit, and/or lock the order. 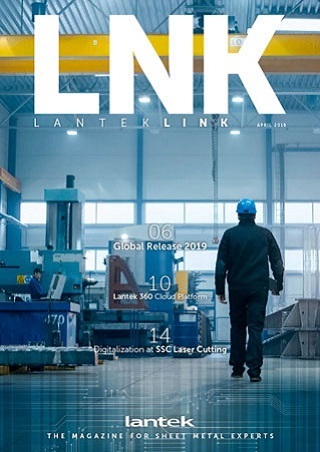 Lantek Integra Sales, which includes: sales orders, delivery notes, and associated documents is completely integrated with other Lantek Integra management modules, such as: Manufacturing, Inventory Management, Purchases, etc. All the different stages involved are perfectly integrated so that the information is automatically relayed from one stage to the next. In response to a sales order, production orders are issued as well as the entire production list required to service the order. There are other options available to block the sales documents: block the invoice after being counted, block the invoice after being sent, etc. Lantek Integra Sales provides different tools to analyze the complete sales cycle. 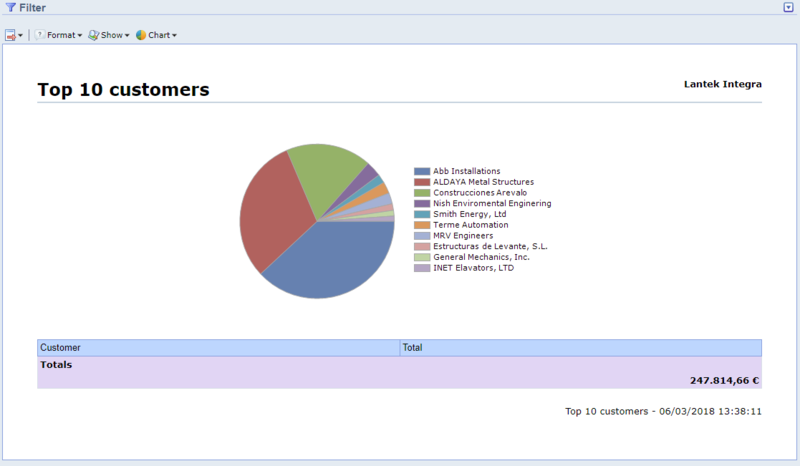 It produces detailed management reports including orders, concurrent costs, and pending invoicing, etc. All this information allows the enterprise to provide a better service to its customers. It keeps all those involved updated regarding the progress of the sales order, manufacturing, consignment, and invoicing. 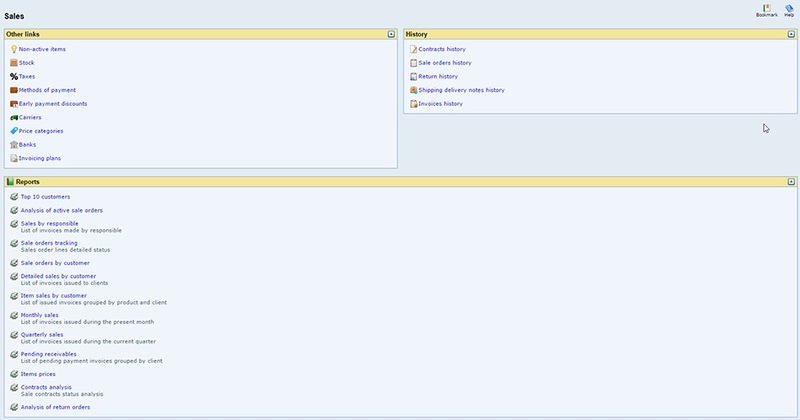 The system also contains an advanced sales history section that can report from a configured date.